Rear Admiral Bradley Allen Fiske (13 June 1854 - 6 April 1942) was an officer in the United States Navy who was noted as a technical innovator. During his long career, Fiske invented many electrical and mechanical devices, with both Naval and civilian uses, and wrote extensively on technical and professional issues. Fiske was born in Lyons, New York on 13 June 1854. He was appointed to the United States Naval Academy from the State of Ohio in 1870, graduating four years later and receiving his commission as an Ensign in July 1875. His early service years included duty as an officer on board the steam sloops-of-war Pensacola and Plymouth, both on the Pacific Station, and the paddle steamer Powhatan in the Atlantic. He also received instruction in the then-young field of torpedo warfare. Promoted to Master in 1881 and Lieutenant in 1887, during much of that decade he had training ship duty in USS Saratoga and USS Minnesota, served in the South Atlantic Squadron on the steam sloop Brooklyn, and was twice assigned to the Bureau of Ordnance in Washington, D.C.
As one of the Navy's most technically astute officers, in 1886-1888 he supervised the installation of ordnance on USS Atlanta, one of the first of the Navy's modern steel warships. In 1888-1890 he was involved in the trials of USS Vesuvius, whose large caliber compressed-air guns were then considered a promising experiment, and was in charge of installing electric lighting in the new cruiser Philadelphia. During the rest of the 1890s, Lieutenant Fiske was mainly employed at the Bureau of Ordnance and at sea, where he was an officer of the cruiser San Francisco and the gunboats Yorktown and Petrel. While serving in the latter, he took part in the 1 May 1898 Battle of Manila Bay. Following the Spanish-American War, Fiske continued his service in Philippine waters on board the monitor Monadnock. During the years between the Spanish-American War and World War I, Fiske advanced rapidly in rank: to Lieutenant Commander in 1899, Commander in 1903, and Captain in 1907. He held many responsible positions on shore and at sea, serving as an Inspector of Ordnance, Executive Officer of USS Yorktown and the battleship Massachusetts, Commanding Officer of the monitor Arkansas and cruisers Minneapolis and Tennessee, had recruiting duty, served as Captain of the Yard at the Philadelphia Navy Yard, attended the Naval War College and was a member of the Navy's General Board and the Army-Navy Joint Board, among other assignments. Bradley Fiske became a Rear Admiral in August 1911, subsequently commanding three different divisions of the Atlantic Fleet as well as serving as the Secretary of the Navy's Aide for Inspections. In February 1913 he was appointed Aide for Operations, a post that later became that of Chief of Naval Operations. As Aide for Operations, Fiske forcefully advocated the creation of a Naval general staff and the elevation of the Nation's preparedness for war. Following a year at the Naval War College, Rear Admiral Fiske was retired upon reaching the age of 62 in June 1916. His professional activities continued into the mid-1920s, however, with service as President of the U.S. Naval Institute and several sessions of temporary duty with the Navy Department. Rear Admiral Bradley A. Fiske died in New York City on 6 April 1942, aged 87. The Navy has named two warships, USS Fiske (DE-143), 1943-1944, and USS Fiske (DD/DDR-842), 1945-1980, in his honor. Born at Lyons, New York, 13 June 1854, the son of Rev William Allen and Susan (Bradley) Fiske, he spent his youth in New York, then in Cleveland and Cincinnati, Ohio. He married Josephine Harper in 1882 and they had one daughter, Caroline Harper Fiske. He received appointment from Ohio to the United States Naval Academy on 24 September 1870 and graudated in the class of June 1874. He was promoted to Commander, 7 March 1903; Captain, 28 August 1907; Rear Admiral, 3 August 1911; and placed on the retired list, 13 June 1916. He served in the Spanish-American War, as an Aide for Inspection to the Secretary of the Navy, January 1912-February 1913; Aide for Operations to the Secretary of the Navy, February 1913-May 1915; member, Army-Navy Joint Board, April 1913-May 1914; at the Naval War College, July 1915-July 1916; placed on the retired list, 13 June 1916; member, Naval Examining Board, Narragansett Bay, Rhode Island, June 1916; temporary duties, Navy Dept, March-April 1920, October-November 1924, March-April 1925. 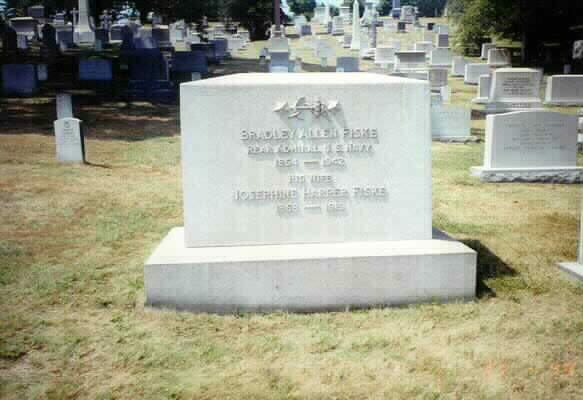 He died at New York City on 6 April 1942 and was buried in Section 2 of Arlington National Cemetery. 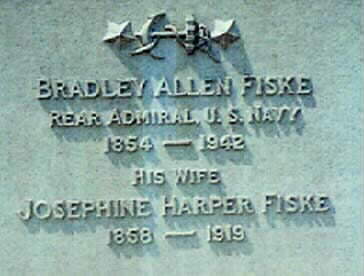 His wife, Josephine Harper Fiske (1858-1919) is buried with him.